AOL founder and internet visionary Steve Case in his new book, “The Third Wave” says that the Education Revolution will be: More personal. More Individualized. More data-driven. Even though there have been many technological solutions that fit the spirit of Steve’s mantra, they have been implemented in a scattered way thus far. In other words we have a long way to go–but we are on a path to get there. The obstacles are huge, people don’t like change, schools don’t have the necessary software budgets and people have been jaded by past technology investments that have been failures. There are numerous examples, but I’ll give just one big one. L.A. Unified School Districts failed $1.3 billion iPad program. In 2013 the District decided to give every student an iPad pre-loaded with Pearson instruction material. One of the drivers of this plan was learning equity, so that underprivileged kids could have the same learning opportunities as the middle class and rich kids. By 2015 the money had been spent and it went down as one of the most spectacular failures in public education history. There were problems with the curriculum, a lack of internet access at the homes of students the program was meant to help the most and nobody had a solution to account for thousands of lost or stolen iPads. This was a software and technology experiment that was badly implemented, but that doesn’t mean that technology in education won’t ultimately be what saves our education system. Technology can and will transform education by making the learning process, and more importantly the learning progress the centerpiece, instead of everybody learning the same stuff at the same time and pace. Everybody’s different, with unique interests and personalities and with widely varied backgrounds. Of course everybody should know the basics, but our system should ultimately do better at guiding students toward an education goal that they’re meant to reach. That’s what Olympic athletes do. They start their focused training toward their end goals early in life and that’s how they become world-class in their sport. Technology can help provide that kind of focus in education. The idea is for cloud based platforms to help teachers and students direct your personal education path. It’s not just about curriculum, it’s about setting learning goals that are individualized so that students can stay in their passion zones, which maximizes learning. We all work harder when we are learning something that interests us. These individualized goals can also be used to help students with learning difficulties or IEP’s, so that we are measuring their progress in a way that allows us to view their progression over time and make adjustments to their goals or learning strategies if progress isn’t happening. Educators should create goals in a goal attainment scaling framework that enables meaningful measurement across spectrums. In other words, use a data-driven approach to measure a students learning progress. Progress toward a students learning goals are a better indicator of a students success and with proper measurement the progress data can easily be compared to the students other learning goals and the overall learning progress of the classroom as a whole, an entire school, district or state. Comparison of measurable data allows students, teachers, parents and administrators to intervene and improve the learning process before too much time passes. Software that encourages meaningful measurement of progress encourages productivity in learning. Instead of comparing standardized grades and test scores, we should be comparing measurable progress of students and our education system in general. This personal, individualized, data-driven approach will revolutionize education. 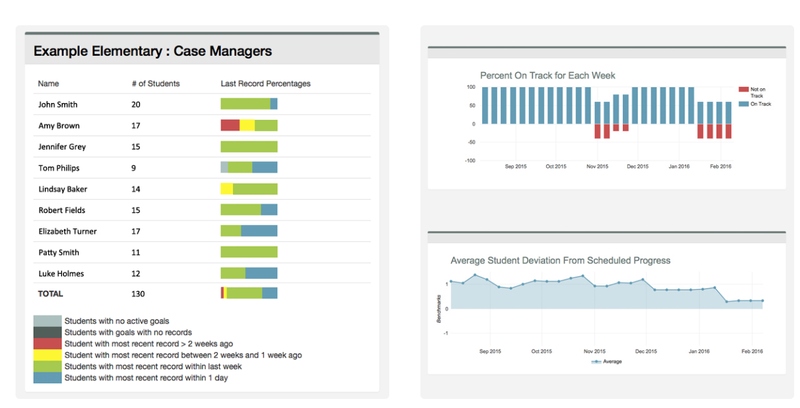 – By Rich Ord, CEO of iEntry, Inc. and co-founder of StudentGrowthWorks, a software platform to measure the progress of students, especially those with IEPs or RTI plans.